Each week, Voice of Russia hosts Red Line, a discussion about the events of the week, as seen from Moscow. This week, events in Syria, changes in Cuba and Bradley Manning. Ekaterina Kudashkina: This week we start with Syria, which is being rocked by unprecedented anti-governmental protests demanding political and economic reforms and the resignation of 45-year old President Bashar al-Assad. We shall then move on to the Caribbean to look at Cuba where the Communist Party Congress—the first in 14 years—coincided with the 50th anniversary of the failed Bay of Pigs invasion; finally, we will discuss the story of the U.S. Marine Private Bradley Manning, still being held in solitary confinement in Quantico, Virginia. In our first heading, Beyond the Headlines, we will take a look at the ongoing mass protests that have gripped Syria’s major cities with violent clashes and this week, thousands demanding resignation of President Bashar al-Assad. They started as minor riots in the south of the country, in Deraa, when schoolkids came out into streets demanding more freedom as they saw in Tunisia and Egypt. But then the police overreacted, they took them to police departments and they jailed them for several hours, and then their relatives stepped in. More than a month after first protests broke out in Deraa, after the first blood was spilled in the clashes with police and unknown snipers, Syria and its leader find themselves at a crossroads. Ekaterina Kudashkina: Two weeks ago there was a congress in which Assad announced changes, but the package of reforms has not been confirmed by the government. Assad invited a team of Western experts to help him with the economic reforms, so there have been some economic reforms, but there have been no political reforms. Mira Salganik: I have a feeling that the president does not have the guts to go into real changes. Sergei Strokan: I think this is a very complicated question. This is not only a question of guts, but what kind of legacy does Assad want to leave. He is at a crossroads—either he will go into history as an old dictator, as his father, or he will introduce changes. If it works, he can reinvent himself as the leader of a new democratic Syria. That is the legacy I am talking about. Mira, do you remember, how he became president 11 years ago? It was a very lively episode of Syrian politics. Mira Salganik: He was a young student, good looking, a nice boy, studying ophthalmology in London, not even thinking of a political career. Then Hafez Assad passes away, the ophthalmologist was quickly brought back to his homeland, and in a matter of days he emerged as a full-fledged president. Sergei Strokan: He had a very limited number of options from the very start. This is not a question of his guts or decisiveness. When you are surrounded with the old apparatus of your father and you are driven by the inertia of old political traditions, how can you act? At the same time he understands the need for change. Just a couple of quotes to illustrate this point: "The world is rapidly changing around us and we have to keep up with developments;” and: "We have to focus on the demands and the aspirations of the people or there will be a sense of anger." Mira Salganik: Some experts say that Syria these days is turning into a battleground between Shia Iran and Sunni Saudi Arabia. Bashar’s father, Hafez Assad brutally crushed Sunni Muslim extremists in 1982. Maybe the Sunnis now want to take revenge. Sergei Strokan: That is very interesting background, but when we speak about conspiracy theories, it should not be restricted to the struggle between Shias and Sunnis. This week, the Washington Post reported that, according to newly released WikiLeaks cables, the State Department has been secretly financing Syrian opposition groups for at least five years. Ekaterina Kudashkina: I have seen that story. It says that U.S. aid continued flowing into the hands of the Syrian opposition even after President Obama began his reengagement policy with the Syrian government. Mira Salganik: You might say that Bashar Assad in his mistrust of the West and foreign influences does have a point, but you can’t simply write off the disconnect of the Syrian people and all that is going on in Damascus as the result of foreign influence alone. We do live in an interconnected world, but each one of us has the right to commit his own blunders. Ekaterina Kudashkina: We always need to be careful when we try to analyze the situation but of course no conspiracy would ever have worked if it were ungrounded, and the ground is there. Anyway, the question is – just how much time is left for Mr. Assad? Here is Dr. Murhaf Jouejati, professor of political science and international affairs at George Washington University and professor at the National Defense University’s Near East South Asia Center for Strategic Studies. With all that is going on in Syria now, we can still see some basic differences from other regimes because Mr. Assad is a young person, he is rather popular with his electorate, and he is introducing some reforms. How do you think the situation could develop? Murhaf Jouejati: He has made a lot of concessions to the protestors. Some of these concessions are, from the prospective of the protestors, insignificant—like the shuffling of the cabinet—others are more significant—like the lifting of the emergency laws—but in the end, Mr. Assad has not met the demands of the protestors. There has not yet been the establishment of political parties, so we are still in a situation of a stalemate and a crisis. Ekaterina Kudashkina: Do you think he will have time to introduce more changes closer towards the Congress of his party? Murhaf Jouejati: Well, the more time that elapses without any concessions to the protestors and the more force is used against the protestors, the less chances that he will have success. Again, the use of violence against armed protestors is angering everyone, domestically and internationally. Ekaterina Kudashkina: So what is your forecast: Is he going to go, or could he still remain in power? Murhaf Jouejati: I think he still has some room to maneuver, but this window of opportunity is closing very quickly. Ekaterina Kudashkina: So what would you suggest he do in this situation? Murhaf Jouejati: I think he has to immediately make public trials for those officers who have used force against the protestors. He has to show that he is truly serious about combating corruption—not merely through speeches, but with actual actions. In other words, he has to take significant steps to show that he is truly is a reformer and not simply an authoritarian leader. Ekaterina Kudashkina: Is there a lot of opposition to the reforms within the ruling elite? Murhaf Jouejati: The ruling elite is very comfortable with this status quo, and the deeper the reforms, the more the elite is going to be alienated, so this is truly a push and pull between the ruling elite and the protestors. Ekaterina Kudashkina: Which means that Mr. Assad is in a lose-lose situation, so to say? Murhaf Jouejati: Not necessarily, because as you pointed out earlier he still has some support and he needs to develop that support, he needs to balance things out, develop enough reforms to satisfy the crowd, and yet not give up the entire house so as not to lose the ruling elite. Ekaterina Kudashkina: Supposing Mr. Assad still has to go, who could take his place? Murhaf Jouejati: There is going to be a power vacuum, and this could unleash a power struggle within the elite and within society. In his absence, there is going to be more chaos. Ekaterina Kudashkina: Assad is always speaking about some external factors in this situation. How strong is the influence of external factors? Murhaf Jouejati: Well, there might be an external hand, but certainly most of the unrest is domestic. 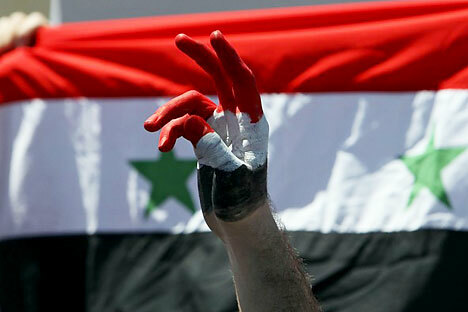 For the past 43 years, Syrians have been kept under martial law, also they have taken into account what is going on regionally, so this is a new era, it is a time of change, that the Syrian population has seized upon it. Ekaterina Kudashkina: So, the situation is dire, but there is still a way out if Mr. Assad has enough courage to move rapidly and to oppose those who are against the reforms? Murhaf Jouejati: Yes, I think that is correct. The situation is dire. He still has a window of opportunity, but a window that is closing very rapidly. Ekaterina Kudashkina: Now we turn to Red Line’s second heading Between the Lines where we usually discuss the most interesting and thought provoking publication of the week. Since one of the most notable events of the week is the Sixth Communist Party Congress in Cuba—the first Party forum in 14 years and the first Congress held since Fidel Castro stepped down as Cuba’s leader, we have chosen for discussion Carlos Alberto Montaner’s piece carried in the Miami Herald entitled “Cuban Communists Headed for Oblivion.” Is Cuba’s present system heading for oblivion or a new lease on life or perhaps something else? Sergei Strokan: I have noticed that speaking at the forum, Cuban leader Raul Castro was unusually frank. He openly said that his country’s economy is “on the brink of a precipice” and proposed a number of truly revolutionary changes. Raul Castro who is 80, proposed a 10-year term limit for Cuba’s highest officials – in the realities of Cuban socialism this is something shockingly new. Ekaterina Kudashkina: Perhaps the ruling elite, despite their ages, are still aware of the need of reform, which is very important. Sergei Strokan: That was not the only change. Among the urgent steps Castro suggested for rescuing the economy were: expanding possibilities for private enterprise, lifting bans on buying property and new cars as well as cancellation of food rationing. As things stand now, Cubans are allowed only to trade property of equal worth, and new cars are allocated by authorities – not bought. Mira Salganik: Cuba by all accounts is in need of reforms. As Montaner writes in The Miami Herald “after 52 years of dictatorship, without a hostile parliament or an opposition that could hinder the government’s work, the six basic elements that determine the quality of life of any modern society have decayed into nightmares: food, potable water, housing, electricity, communications and transport.” The question is how to reform and who is to do the reforming? Ekaterina Kudashkina: This story to me seems a little bit tragic because it was written by an emigrant. Of course there are a lot of problems, but maybe not as grim as he tries to depict. Cuba has been seen as a potential market by many global players and they have started to develop tourism there. Unlike in Syria, here the main question is who will start the reforms. Sergei Strokan: What about Marino Murillo? Will he succeed? Murillo is called Raul’s “ideological stepson”, and Raul wants to build socialism without subsidies and capitalism without markets. Ekaterina Kudashkina: The 50-year-old economist, former Army officer and former Minister of the Economy is said to owe total allegiance to the general-president and to be committed to retaining the basic elements of the communist system, although eliminating paternalism. I think there are two major scenarios of the transfer from planned socialist economics to something more liberal; one is our perestroika and the second one is the Chinese model, so it is up to the Cubans which they will choose. We are now joined by Vitaly Makarov, the former Head of the Cuba section at the international department of the Central Committee of the Communist Party of the Soviet Union. Vitaly Makarov: This is probably the most difficult question. They are not turning away from the ideas of socialism. Political power belongs to the Communist Party, whereas the economy is evolving on the basis of market principles. This is probably what the Cubans are striving for. But they have encountered some difficulties. The situation in Cuba is that it’s not only domestic factors that play an important role—there are external factors, such as the ongoing economic blockade of Cuba. One other thing that seems paramount to me. I thought that along with Raul, there would be a team of young leaders coming to power, but this didn’t happen. I think that the most important thing ahead for Cuba is moving out of a plane of a resistance between socialism and capitalism to aligning themselves to a new center of political influence in the world. Before, the beacon was the so-called “socialist camp”, whereas now there are lots to choose from: the triad of U.S., Canada and Mexico; there’s China, there’s Europe, there’s the Asian countries and also the Latin American countries, of which Cuba is a part. Plus there’s the new configuration of BRICS, which I think has a promising future. Cuba needs to choose. Ekaterina Kudashkina: And now we move on to our third heading – the Man in the News. And I suppose this time there are two men in the news – the U.S. Army private Bradley Manning and the U.S. President Barak Obama. Sergei Strokan: It seems that in order to win another presidential term, Obama will have to reinvent himself and reignite his base. As I see it, in an uphill battle for presidency every soldier would matter for him, including Private Bradley Manning. Ekaterina Kudashkina: Well, just to remind our listeners—since July, Manning has been kept at the Marine Corps brig in Quantico in conditions that have become a subject of growing alarm both in the U.S. and in other countries. The controversy over U.S. Army Private Bradley Manning, suspected of giving classified material to WikiLeaks, which was initially seen as a purely U.S. domestic story, is rapidly growing up into a large-scale international scandal. Mira Salganik: The scandal is not only raising uneasy questions within the U.S., but is also putting the Obama administration at odds with some of its key European allies. Sergei Strokan: Moreover, it casts a long shadow over Washington’s efforts to champion a global drive for peace and democracy, as well as to advise other nations – from China and Russia to Iran and Myanmar on how to safeguard basic freedoms and human rights. Ekaterina Kudashkina: Some may argue that Manning is a traitor who has presumably downloaded to WikiLeaks some 250,000 sensitive State Department and Pentagon cables on the U.S. operation in Iraq. His move in fact hurt the U.S. international standing, undermining national security. However, the question whether Bradley is “a soldier or a traitor” is yet to be answered. Personally I have answered to myself, he is a traitor to me. But the conditions of his containment in Quantico have already become a matter of concern. Sergei Strokan: In an open letter, scholars stated that Manning’s treatment "violates his person and his liberty without due process of law and in a way it administers cruel and unusual punishment of a sort that cannot be constitutionally inflicted even upon someone convicted of terrible offenses, not to mention someone merely accused of such offenses." Ekaterina Kudashkina: Even if he is a traitor he shouldn’t be treated like a dog. Sergei Strokan: It seems that today the enthusiasm over Obama has largely evaporated. In a letter to President Obama, the human rights committee of the German parliament called the conditions of Bradley Manning’s detention "unnecessarily hard and having a penalizing character." Weeks after Barack Obama has officially announced his participation in the 2012 presidential campaign, more and more people both in the U.S. and in the world are asking: “Who is Mr. Obama? Is he the same person we voted for and supported in 2008 and after?” “What if everything we think we know about the president's political position is wrong?” -- writes Peggy Noonan in the Wall Street Journal. Mind you, the story is not about Manning, but about Obama’s domestic and international failures: the failure to close Guantanamo, Afghanistan and Libya are among them. Ekaterina Kudashkina: Anyway, my question is who is Private Manning? Is he a traitor, or a whistleblower? Our next guest speaker is Joe Glanville, an editor with the Index on Censorship, a London-based organization that has voiced its support for Julian Assange. Ekaterina Kudashkina: Do you see Mr. Manning as a traitor the way he is described in the United States or perhaps he is someone who wants to serve the truth? Joe Glanville: What label you give him depends on where you are sitting. As far as the government is concerned, he is a traitor, but as far as he is concerned, he is a whistleblower. He came across information that he felt was in the public interest and he needed to leak. Ekaterina Kudashkina: Whether the investigation manages to confirm that he was a whistleblower or perhaps not, do you think that the way he is kept in his solitary confinement is a violation of human rights? Joe Glanville: Of course it is a violation of human rights and I believe now that he is being moved to a prison with much better conditions. It has been a matter of great concern for human rights organizations that he is being treated very, very, very severely and clearly the administration wanted to punish him. Ekaterina Kudashkina: Do you think that it is a natural reaction of the Department of Defense towards someone they believe is a traitor, or is it still a fault of the current US administration? Joe Glanville: I think it is always the case, that when anyone leaks confidential government information they are always treated very harshly. It is always a great concern for us, because most of the time information that is being leaked is very clearly in the public interest, but as far as the government is concerned, these are bad documents that they want to keep secret. Always in my experience they act extremely harshly, to make an example of whistle-blowers. Ekaterina Kudashkina: What we are witnessing is some kind of dilemma. It is always a question whether a person should act in the pubic interest or should he ignore facts that actually harm the society but protecting the interest of the government. Joe Glanville: Probably the solution is that there has to be a recognition that some information that is leaked, even if it is leaked without the approval of a corperation or a government, can be in the public interest, and there is a justification for the leaking of the information. I do not think that the leaking of information per se should mean that somebody is prosecuted and certainly never treated in a way that Bradley Manning has been treated. Ekaterina Kudashkina: Do you think that it really makes a difference whether a person is paid for the information or not? Joe Glanville: I think it depends on the circumstances. I think in most cases whistle-blowers do not tend to be paid, they do it as a matter of conscience, or of great ethical concern, but I think that it just depends on the context.